Jesus said of himself, “I am the bread of life; he who comes to me will never hunger, and he who believes in me will never thirst” (John 6.35).2 Later, He divides bread and shares it with his followers, saying “This is my body which is given for you” (Luke 22:19). Jesus fulfills this analogy as he sacrifices his life on the cross, receiving the punishment and shame that we deserve for our selfishness. We can receive forgiveness and live forever with God because he offered his body, dying and then rising again. That said, there is more to the show than a simple allegory. We can find detailed spiritual insight in a random episode, and by random, I mean the only one I could acquire with English subtitles. The episode, “Ruby’s Wish”, centers on Ruby, one of the magical “Aurora Girls” who paints the Aurora Borealis with a giant red brush. Due to her selfishness and pride, the Aurora Princess expels her to earth in search of the Aurora Drop, a magical item that will grant her three wishes that she can use to return home. After meeting Anpanman and his friends, she lies to them, telling them she needs to find the Drop to save her realm. Of course, they help, and as they continually sacrifice and risk themselves for her, her guilt swells. Joyous Anpanman loves his friends and enemies. At the climax of the episode, they have found the Drop, but so have the three villains and their powerful robot. The latter malfunctions, and after attacking everyone, only Ruby remains unharmed. Even Anpanman is severely weakened, using his dwindling strength to prevent the robot from crushing the villains who made it. As he seeks to save the lives of his friends and enemies (Christ figure! ), Ruby remembers their earlier conversation when he sacrificed himself for her. She resolves to act selflessly, saying “Anpanman, you give me your strength and good will.” She not only risks her life to retrieve the Drop, she uses the last wish (as the first two have been foolishly squandered by the villains) to save everyone from the robot, sacrificing her dream of returning to her realm. Thankfully, the Aurora Princess sees this act of love as well as Ruby’s honest confession of her prior selfishness, and the Princess welcomes her back home. First, we see that Anpanman’s sacrifice satisfies. But in addition to joy, it brings strength of character as well. We find again and again, that in life and in our favorite stories that people love when they are loved, and that we sacrifice when others sacrifice for us. When Ruby remembers his sacrifice and the joy it brought her, this person who started the story filled with selfishness and pride finds the strength to live selflessly instead. And while Anpanman can only inspire, Jesus can actually transform us when we trust Him, fulfilling Ruby’s words that He gives His strength and good will, or as the Apostle Paul says, “for it is God who is at work in you, both to will and work for His good pleasure” (Phil 2:13 ESV). Unknowingly, Ruby followed the advice in the Bible: “Taste and see that the Lord is good” (Psalm 34:8). Let’s follow her example by acknowledging our hunger and asking Jesus to satisfy and fill us. And if you have already found that He does, you can also gain from Ruby’s experience. When life’s circumstances call you to sacrifice for others, remember Jesus’s sacrifice, ask him to empower you, and you can act selflessly in a way that you did not think possible. While not the normal thing you write about I’m glad you did. I know some one living in Japan and will certainly share your article with her. Did I miss how you came across this Anpanman? Thanks Eric for complimenting and sharing the post! 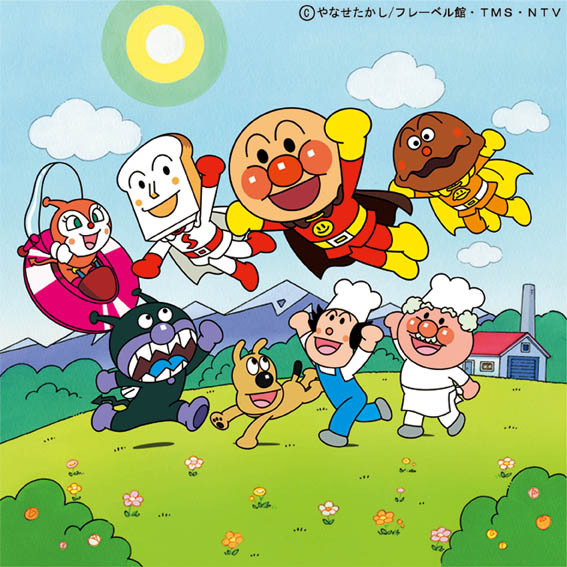 I first heard about Anpanman from a Japanese friend at my workplace, and I knew at that moment that I wanted to write a blog article about it. Well, Jesus is Middle Eastern. That said, I think we learn from the example of Anpanman that He and His Good News comes to every culture in a way that resonates for them. Pita in the Middle East, Anpan in Japan. With my celiac disease, He’s a fantastic gluten free croissant, which trust me, is a miracle.